One of the first things we need to cover is how to do proper guitar tuning. We’re gonna focus on the standard set-up for our lessons going forward. As you get better and comfortable with playing, you can start to explore alternate methods such as Drop D or one of the many other open string set-ups. OK wait - I guess maybe I’ve gotten a little ahead of myself talking about alternates. Let’s stick with standard tuning for now. 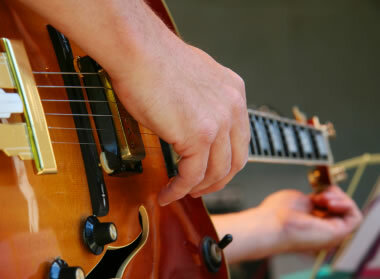 It’s a good idea to get your guitar tuned up before you start getting into the individual notes, so let's do that now. Here are a few different ways to get tuned with the standard notes. Of course, once you've learned how to tune your axe and you want to try out some of the alternates, you can use these same methods and tools. Speaking of tools, computers and the internet have made it a lot easier to get into music. You should really learn how to tune your guitar manually, but starting out, let's just get you tuned so you can start jamming. I've put together an explanation of the tuning tools you can use to get yourself going quickly and easily. You can also get access to free online tools and programs to use right now to get tuned up. I've been able to find some really cool sites that have some excellent free online tools to get tuned, including more common alternate set-ups. I've added them to the tools page for easy access. Any discussion about tuning your guitar wouldn't be complete unless we covered the alternate guitar tuning methods. Example? Metal and Punk artists really like to use the Drop D tuning for their songs. There are so many different ways to tune your guitar, we could go for days just looking at the different available tones. So we'll just cover the more common ones found in rock & roll.